The world of bicycling has a lot of niche categories. Obviously “gravel bikes” are one of those, (but maybe becoming less so everyday), and there are plenty of others I can think of right off the top of my head. “Niche”- just what does that mean anyway? One of the definitions that fits this usage is that which says, “a specialized market“. Gravel bikes are definitely that. However; there maybe is no other market more specialized, more niche, than single speed bikes. Add “gravel” to that, and it gets even more specialized. So, the bike we have on review here definitely isn’t for everybody, but if this interests you, hang on, because the State Bicycle Comapany’s Warhawk is an interesting offering. 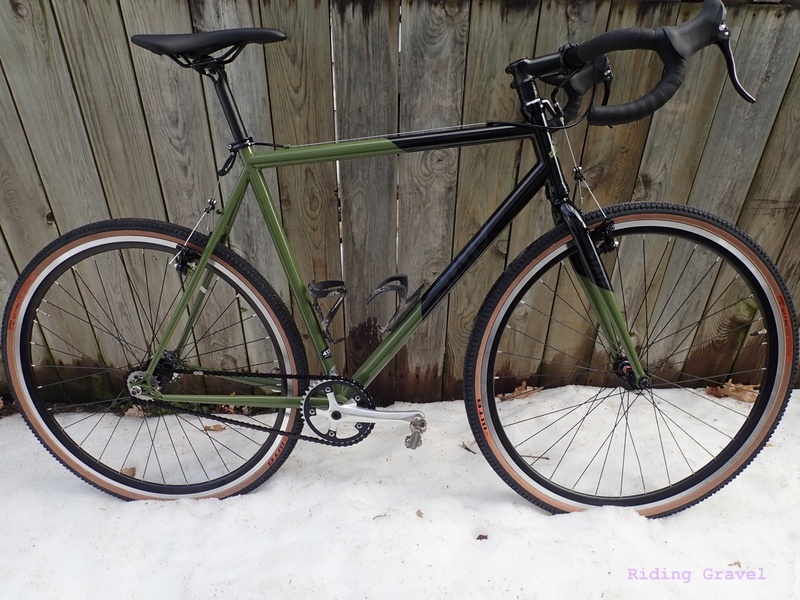 The State Bicycle Company Warhawk single speed gravel bike. This bike would seem pretty straightforward. A single speed? What do you really need to know? Well, as it turns out- plenty. I’ll get into that down further. First off, the frame and fork are good ol’ 4130 CrMo steel, and the frame is double butted to boot. The welds are nice, nothing spectacular, but nice. There are two sets of water bottle bosses. Curiously, there are eyelets on the track ends, but no rack or fender mounts elsewhere on the frame. Cantilever brakes from TRP do the stopping. The crank set is a handsome forged model, (no brand specified) and is set up with a 39 tooth chain ring. (Spec chart says it is a 36T) The rear wheel is interesting in that it has a disc hub with a standard free hub body laced to the 30mm deep aluminum rim brake rim. The cog provided with the bike is a nice black anodized aluminum one with matching black anodized aluminum spacers. The thing is, the cog spec’ed was a 21T X 1/8th pitch. (Spec says 19T) This causes some concerns which I alluded to earlier and will discuss below. TRP cantilevers do the stopping duties. The Warhawk can be upgraded with a tubeless tire option. This is how we got the Warhawk. 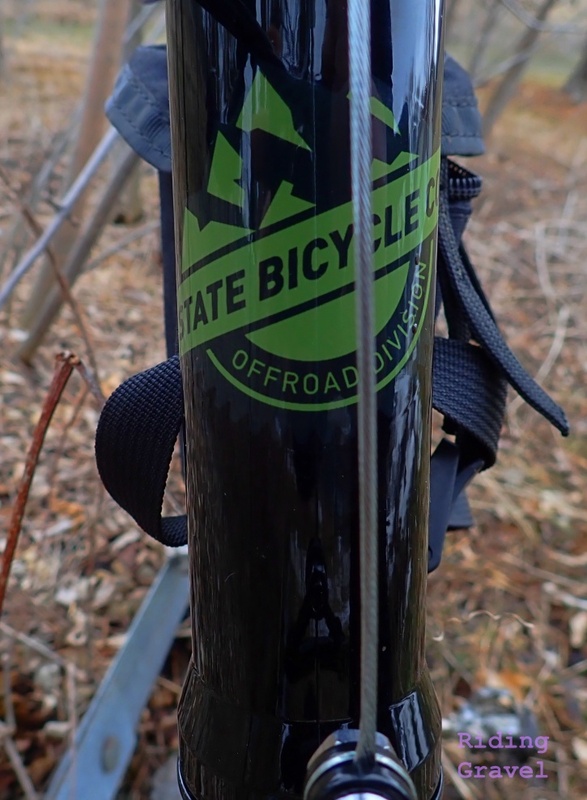 So, the skinwall WTB Riddler 37’s are set up with tubes out of the box, but State sends along a set of tubeless valve stems, three 4oz bottles of Stan’s sealant, and pre-tapes the rim well on each rim. This made setting up the tires tubeless a snap as all you have to do is break one bead, remove the tube, insert the valve stem and sealant, and pump up the tire. As I pulled the Warhawk from its wrappings, I couldn’t help but think that this might be one of the best, most understated, handsome looking bikes I have sen in some time. It just has a classy look to it, and the skin wall tires really “pop” and make it look great. Well, at least I think so! However; looks are only one part of the experience here. The rest of the bike has to measure up. Fortunately, the component spec mostly lives up to the looks here with the exception of the cog chosen for the rear wheel. After swapping out the stock 21T cog for a 19T fixed cog, I gained enough clearance to make me feel at ease with riding the Warhawk. The stock combination of 39T X 21T caused the rear wheel to be too far forward into the frame. So far, in fact, that I maybe had a paper thin bit of clearance between the tire and the chain stays. Something had to be changed. This is where running a single speed drive train can get complicated. I mean, you’d think this would be so simple….Actually, it isn’t bad, but it definitely requires some “thinkering” on the rider’s part. 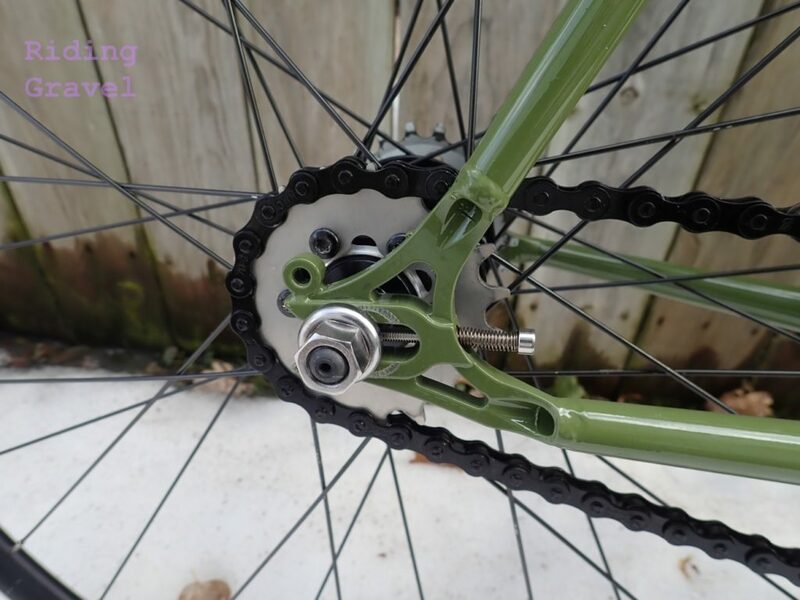 So, you need to figure out what gearing range is best for your single speed activities. I have arrived at using “gear-inches” that fall in the 60’s for my uses. (You can also use “Gain Ratio” calculations as well) One has to do some experimentation to figure out what works best for your terrain, riding style, and physical abilities. I have done quite a bit of research and testing for my personal use, so I knew a 18T-20T cog would work out best. So, grab one and slap it on there. Hmm…..not so fast there pardner. There is chain pitch to consider. Remember when I stated that the stock cog was 1/8th inch pitch? Well, all my cogs are 3/32nds. But…..that’s okay. You can cross pollinate those two things. 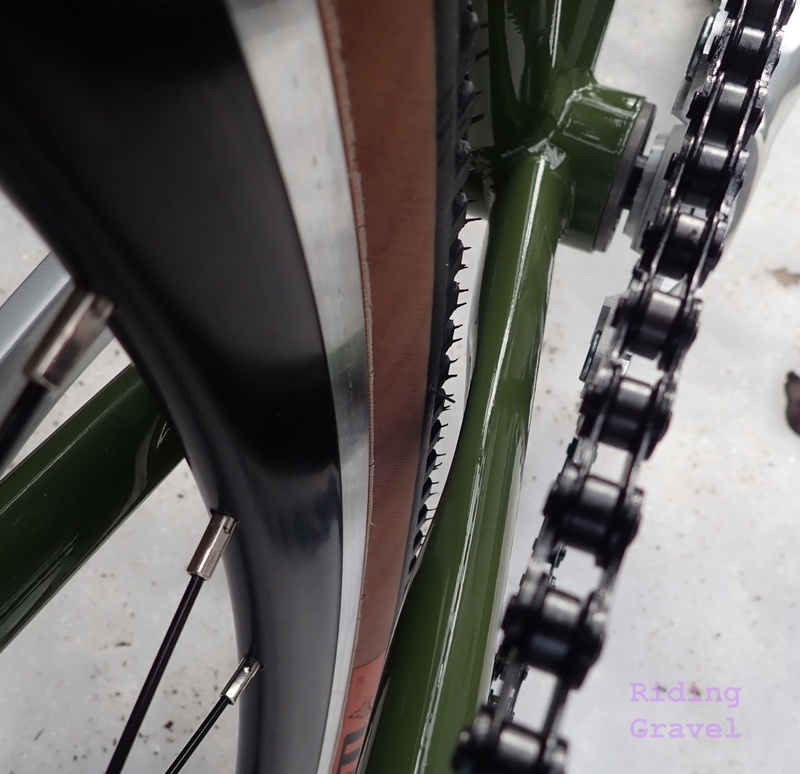 However; you cannot use a 3/32nds pitch chain on a 1/8th pitch cog or chain ring. So, this all informed my final choice. Now, to alleviate the too-little clearance issue, I could have simply added a half link to the chain, or I could have used a different, slightly longer 1/8th inch pitch chain. But, I would have had a 39T X 21T gear combination. Too spinny! Besides, my stash doesn’t include those 1/8th pitch things, but I did have a plethora of 3/32nds pitch single speed cogs and a very unique cog, called a “Tomi Cog”, from which to choose from. I decided that I maybe could get a two tooth differential between what was sent and what I chose without having to resort to modifying or replacing the chain. Based upon my experiences, two teeth differences are about all any single speed tensioning system will account for. 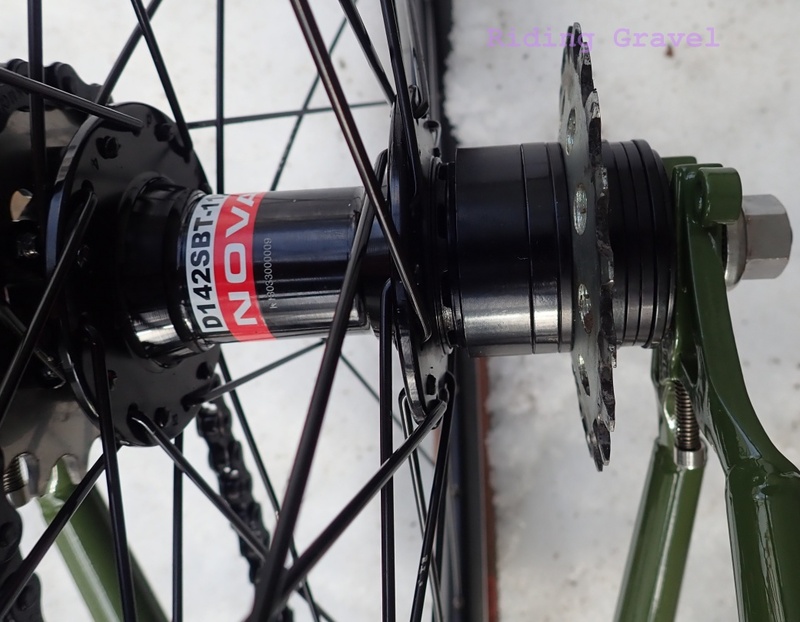 So, I bolted the 19T Tomi Cog to the disc mount on the hub and used a 20T Surly cog on the free hub body as a bail-out gear. The difference in diameter between the 21T stock cog and the 19T Tomi Cog allowed me to move the wheel back in the track ends enough that I got decent clearances for the tire. Plus, the 39T X 19T is right in my wheelhouse for gearing. Perfect. Whew! I told you it was more complicated than you might think, and we’re not quite done yet! There is the installation/extraction procedure you should familiarize yourself with concerning the rear wheel. You may have noticed that this bike uses a nutted rear axle, which is a good thing with a track end. That requires a 15mm box end wrench to remove. 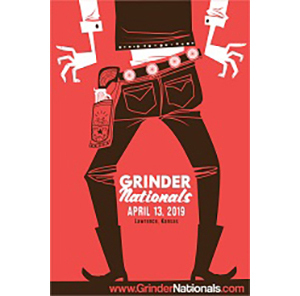 You will also want to carry a multi-tool with a 3mm hex key, or just carry a 3mm hex key, because you’ll need that to adjust the screws in the track end out to remove the wheel and in to help center the wheel. You also may want a 5mm hex wrench, or make sure your multi-tool has one, so you can make small adjustments to the rear brakes, as they must be adjusted whenever you move the axle back and forth in the track ends. This would come into play only if you change ratios, so in my case, with the “flip-flop” set up, it would be a good thing to have along. See……not as simple as you might think. To be fair though, the “simplicity” of a single speed is not necessarily in the hardware, but in the experience. That’s another story…. 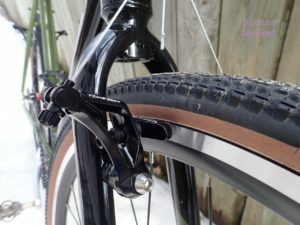 Okay, beyond the mechanics of single speed set ups, what did I think? Well, I wish there were more tire clearance, that’s for sure. 37mm is pushing things here, and that rim isn’t a wide one either. Those looking for a big, meaty tire on a wider rim in a single speed package will need to look elsewhere. That said, I was impressed with the components. The Zoom stem, handle bar, and seat post, (which looks all the world like a two bolt Ritchey post), are nice and will do the job. The wheels were serviceable. They set up tubeless well with the WTB tires. 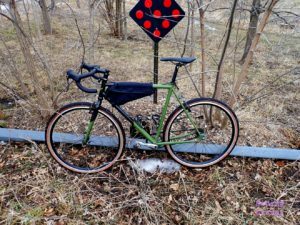 Once I sussed out the drive train issues, I was impressed with the ride of the bike, which, as you might suspect, felt springy in a good way, but stiff and not like a noodle. So Far….With all of that said, one has to look at the price tag here. In the configuration we received the Warhawk in, it retails for $729.99. What can you even compare this bike to? 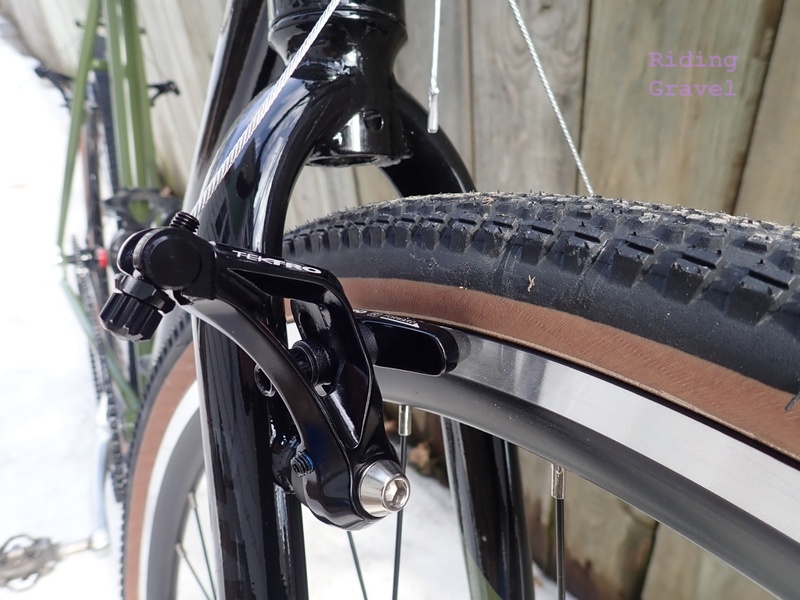 There are not many single speed gravel bikes! I mean, we are talking a very niche segment of the market. I feel that for what the Warhawk has shown me, it is a good value, with a couple of downfalls, one of which is easily remedied, the other not so much. I’ll get to its gravel manners in the next post, “Checkpoint“, coming in a couple of weeks. NOTE- The State Bicycle Co. Warhawk was sent out for test and review to Riding Gravel at no charge. We are not being bribed, nor paid for this review and we will strive to give our honest thoughts and opinions throughout. Seems like it would be simpler to get a regular bike and not shift. @Andrew- If I had a dime for every time someone posts this when it comes to single speeding. otherwise WAbI thunder and or Norco SS Threshold. yet at the same time my (road) SS seems to get the abuse and the neglect. 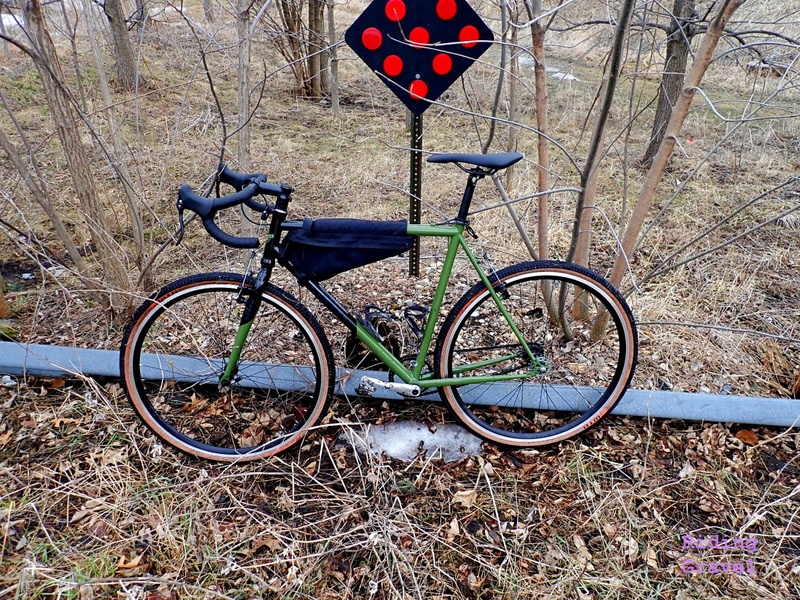 I imagine a gravel SS more so….. So the State price point is attractive. Really I’m just jealous of people with knees young enough to pull this off…..
Did you weigh it? Curious to see if it’s any lighter than the one I had in 2015, back when it was marketed as a Cross bike it was 29 pounds for the 52cm size. @Randall Daniels- I have not weighed it properly, however, there is no way it goes 29lbs. I’ll get a true weight on it for the Checkpoint post, but my guess is low 20’s. It weighs 26lbs, 11oz with two bottle cages, a pair of low end SPD’s, and a Jaand frame bag with tools, air pump, and spare tube in it. Wow. I’m not looking for new bike or a SS. However State Bicycles knows how to build a proper website to showcase their product with the right pics, info, at hand and properly connected to social media reviews. Other bike brands – LEARN something here. I’d be even more impressed if they kept it in stock more than once every 2 years.